On Tuesday, April 8, Microsoft is set to retire its popular Windows XP operating system after more than 12 years on the market. There were many features of the OS that will not be forgotten by its vast amount of users, but perhaps most notable of all is the default wallpaper image that has since become one of the most recognizable images in technology history. While many people thought the image of a sky interspersed with gentle clouds set against a tranquil, green pasture was created by digital means, the image was actually taken by American photographer Charles O’Rear in 1996. O’Rear composed the image “Bliss” during a trip through California’s flourishing wine country. “Bliss,” as seen today in California’s Sonoma Valley. While on his way to visit his girlfriend and future wife Daphne, O’Rear noticed how the passing storms gave a brilliant vibrancy to the area, and using his Mamiya RZ67 film camera, he captured an image that would become a reliable mainstay of the Windows brand. In a recent interview with CNET, O’Rear said he uploaded an unaltered version of “Bliss” to the stock photo and image licensing service Corbis, which was founded in 1989 by former Microsoft CEO Bill Gates, but the image was slightly retouched using Photoshop before becoming the first image that greeted mid-90s Windows users. O’Rear’s image was purchased for an undisclosed amount and a non-disclosure agreement with Microsoft prevents him from going into specifics, but the former National Geographic and Los Angeles Times photographer claims the sum was the largest-ever paid for a single image. 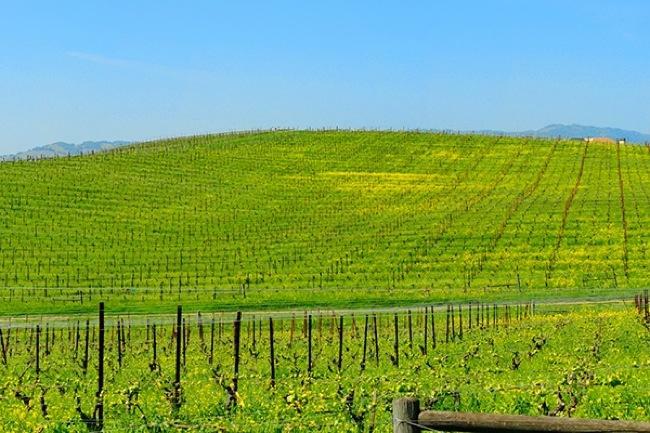 With Windows XP moving to its own greater pasture, the aptly titled “Bliss” will remain etched into the minds of millions for years to come. Corbis now boasts a stock of over 100 million images, but finding a more iconic image will be no easy feat.